Often we imagine a life that is perfect. A life full of love, loved ones’ affection, smiles and no sorrows or grief. A life straight out of a fairy tale. But sometimes we forget what makes any ordinary life a sweet life. We so casually ignore that important thing that makes a life worth living, a love worth deserving. 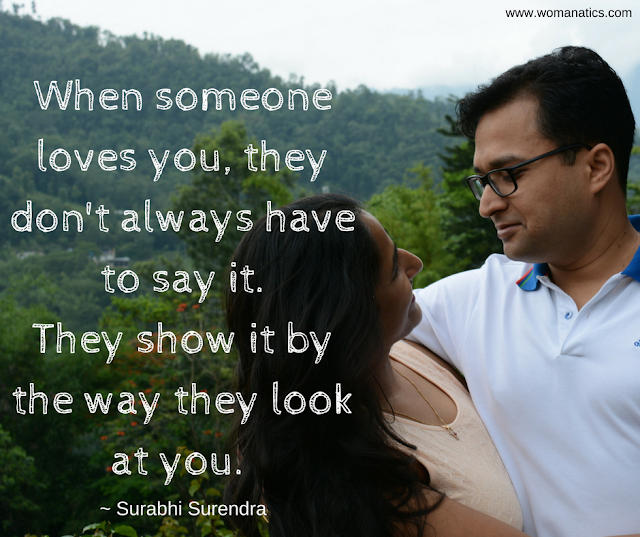 We need to show our affection to our loved ones if we want to be loved. Unless the love is expressed, how would one know if love exists at all? Love is intangible. It is not an object that can be bought to prove that you love the other person. It is a feeling that needs to be said, communicated and expressed. It is up to you how you do it. Some say it explicitly. They say ‘I love you’ in clear terms. Some show it by acts of service; they do things for their lovers. Yet others adopt even more subtle ways of expressing their affection to their loved ones. There is not one, perfect way of showing affection to the people you love. To each his own. I have written an article on ‘Five Languages of Love‘. That article talks about how different people have different ways of expressing and expecting their love. While each way of showing love is fine as long as you are communicating and your partner is getting it but there is certainly one way that I believe surpasses all, and in my humble opinion, it is the best way to show your love and affection to those who are close to your heart. I recently watched a video on Oprah.com where one of my favorite authors, Toni Morrison (read my review of her book The Bluest Eye) talks about that one, best way. Watch the video here and you would know what I am talking about. In the video, Toni asks if your face lights up at the sight of your loved one, especially with children. Here she is particularly talking about the children. She suggests that when our children walk into our room and look at us, they expect us to be glad to see them. They want us to accept them the way they are and not how they are looking at that moment. Compliment them instead of looking at them and finding faults. Toni’s advice on just being happy at the very first sight of your children is so profound and perceptive. Imagine you, as someone’s loved one, say your mom’s child or your husband’s wife, walk into their room and the first thing they say is – ‘What happened to your face? It looks dull’ or your husband complains, ‘why are you wearing this yellow color. You should have worn red’ or worse still, your friend or sister remarks, ‘look at your eyeliner. It is all smudged’. It is understood that these instant and spur of the moment remarks are purely spontaneous. They don’t mean our family does not love us or they are not happy to see us but these general statements about how we appear to them at the first sight, makes us feel vulnerable and unaccepted. It feels that they have failed to look beyond what we are carrying in terms of appearance. It feels we are just a body to them and not the soul with which we feel connected with them. It has happened with me several times. Last year, I remember, I attended a small family function and the moment I entered, I met my sister. She looked at me and remarked, ‘what kind of suit are you wearing? Couldn’t you find a brighter color?’ I felt so bad that of all things, all she could notice was the color of my suit. I know she loves me. I also know she is generally critical of my fashion sense but this helps me because she is the one who will make the effort to help find outfits for me. I am aware that her gesture of pointing towards the dull, off-white color of my suit was to help me in looking better, but this is not what I wanted from her at that moment. Maybe if she had said it, after we had settled for a while and talked about each other’s well-being, it wouldn’t have hurt me that much. This video helped me realize that I have committed this mistake as well and not once but several times. So many times I criticized mummy for not using any lipstick or a nice color before stepping out. In a social gatherings, I get quite wary, and sometimes critical, of how my family members are carrying themselves. Maybe it is because I am associated with them, I want them to look good. If they look good, then I do too. And my status rises a bit in the eyes of others! But I now realize how superficial and fake that is. That is not me. My love for my family does not depend on how they look in public! I never realized I did all this until I watched this video. And now I feel quite ashamed of my unnecessary, unsolicited and absolutely ridiculous statements on appearance. When you love someone, you love them. You feel happy for them always. You want to be with them. You want to see them. You want them and not their clothes or good looks. Your love and affection for them depends on who they are and not how they look. Since then and after having spent years with my husband and noticing him how he never even bothers about my clothes and only looks brighter after having me in front of him, I have changed my habits. I now focus on my loved ones being there. I light up at their presence. I can also tell you how it feels when you truly wait to meet your loved one. Each afternoon, when I go to pick Pahal up from her school, I instantly smile at her sight. I don’t care if her hair is frizzy or her pants are laden with dirt or if she is looking untidy and worse than other kids. I just don’t bother about all this. All I know is that I am glad to see her again after 4 hours and that all matters to me. So, all mommies and wives and sisters and friends out there, next time when you see the person you love, gaze beyond the appearance. Light up. Cheer up. Smile because they are there. And this is the best way to show affection to the ones you love. Smile is the best remedy for everything. I agree, we must show our love. Hi Bhavna.. Thanks for writing. I replied to the comment and my comment is vanished.. hihihi. You are so right. Being their loved ones we should be more cautious of what we say to them. Glad you like the post. Stay around and keep writing.